A Peaceful Location Where You Can Enjoy Nature At Its Best! SPECIAL OFFER - White Owl continues to be blessed with so many wonderful guests. In celebration of the New Year 2019, and in appreciation to you all, we would like to offer REPEAT GUESTS a $30 credit for your next booking. Also, we would like to extend a $30 credit to you for any referrals that book their reservation before March 15, 2019. The owner is now caretaker to the property previously owned by her father, Frank Medina, who was the Head Athletic Trainer for UT's football team and was also trainer for the U.S. Olympic Track & Field Team. Her father's respect for the land was part of his Cherokee heritage which was passed on to his daughter. 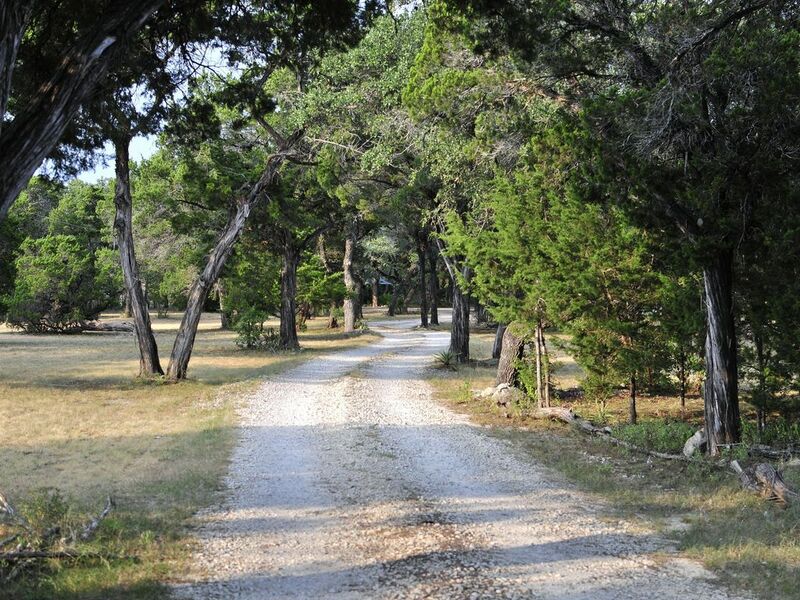 Located on 5 peaceful acres that has waterfront on Lake Travis. View of Lake Travis from the cabin. The renovated old cabin is approximately 100 years old. Take a nature walk on the trail down to the lake. Quiet, semi-secluded area for privacy. All electrical appliances in the kitchen. Large covered porch with rocking chairs facing the lake. Large stone fireplace. Large front lawn shaded by giant trees. All linens are furnished. Patio with BBQ grill. Picnic Table. Fire pit. Kitchen has everything you need to prepare meals and snacks. Private bathroom with shower and toilet inside cabin. Hot and cold running water. Heating and air conditioning. Only 10 minutes west of Cedar Park. Restaurants, pharmacies, 24/7 Hospital and shopping just minutes away. Never thought of myself as a "rural" or "country" girl, nor an "outdoors" person, until our father passed away, and I spent more time on this land. Over time, I realized the importance of connecting to Nature, paying attention to the messages Mother Earth provides us every day, if we just listen, open our eyes and ears, and hearts. Our father loved this land so much. He worked so diligently to clear, clean up and prepare the land. He was not an aquatic type guy...no boat dock nor boat slip, no water skiing. He did have a plan in his head and in his heart...he prepared this land for his family. After spending time out here, I felt moved that I was the "Keeper of the Land", and all that entails--the importance of paying attention to our surroundings. Cabin is approx. 45 minute drive from downtown Austin. Metro Rail is good for those who don't want to take their car. No telephone, guests have not reported any problems with their own phones. Dining area is a breakfast bar, otherwise enjoy breakfast on the porch! the old fashion kind--Dominoes, Chess, Pick-up-sticks, etc. Not provided by Owner, guests have brought their own, and enjoyed carrying down to waterfront or going to Jones Brothers Park in Jonestown. Also there are offsite rental groups. White Owl porch seems to be a preferred peaceful spot for morning coffee and evening contemplation. Seasonal birds. WHITE OWL MISSION STATEMENT - Dedicated to our father and the Native American Spirit, to provide an environment for one to connect to mental, physical, spiritual, and emotional self-healing. When in doubt, go back to Mother Earth. Aho! Wado! A fantastic sweet spot to unwind, unplug and recharge. This cabin is close enough into town to take a quick drive to and fro when you need to, far enough away to be able to enjoy the peace of the lake, quaint enough to feel like you've stepped back to a time when fewer things in life were nagging you for constant attention. The fireplace inside is fantastic - and the fire pit outside is a great spot to enjoy an evening. The back porch is perfect for dinner and enjoying your morning coffee in the rocking chairs. Definitely keeping the White Owl Cabin on our lists of places to enjoy! Heather, it is always so heart-felt to meet such special folks. Knowing that y'all appreciate this sacred space fills my heart with joy. Looking forward to your return. A'ho. This place was absolutely the most peaceful relaxing place highly recommend !!! from life for awhile this is your place !!!! Holly & Rob, this was a perfect example of everything falling into place @ the right time with the right folks! So enjoyed meeting y'all and the shared conversations. Please come back "home" to White Owl soon. Connie is a gracious host with a beautiful property. The historic cottage had all of the ammenties expected. I would love to go back for another visit. Amy, it was so delightful to have you and Jon @ White Owl. My wish is for y'all to return soon and getting the opportunity to visit with you. (Looking forward to learning more about your blog and what you do.) Until next time. Quiet, restful, relaxing. Away from it all! Ed, thank you and your family for taking such good care of White Owl. I enjoyed our shared conversations. Wishing you all the best in your endeavors. Look forward to your returning to White Owl. My husband and I stayed at White Owl Cabin for our 10 yr Anniversary. It was a very peaceful and relaxing vacation. Meeting Connie, the owner was the best part of our trip. She is a true blessing. We will definitely go back! These folks are the greatest. They loved, respected and cared for White Owl as if it were their own. We look forward to their return. This stay was a gift to my daughter and son-in-law. They could not say enough good things about the place. Perfect get away for a couple! Connie is a pleasure to deal with and she really made them feel welcome. Cindy, thank you for sending Amy and Dakota to White Owl. They are such a very special young couple. Many blessings to you and your family. Look forward to meeting you when the time is right.